to the Wild West Retreat -located in Escalante Utah one of the most beautiful places in southern Utah. Escalante is a small remote town nestled in the Grand Staircase Escalante National Monument with Bryce Canyon, Capital Reef, Dixie National forest and Lake Powell just a short drive away. . Whether your interests are hiking, finding peace and quiet, or riding your horse in the most remote high desert in the lower 48 states, we have it all. 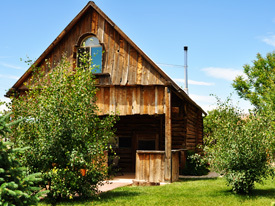 At the Wild West Retreat we have two separate vacation homes The Barn and the Pioneer Home. Each have a fully equipped kitchen, large private yards with lots of trees, a breakfast basket with everything you will need to cook up breakfast, TV with cable and a DVD player, board games for an enjoyable evening by the wood burning stove. Your stay will be private, quiet and peaceful. 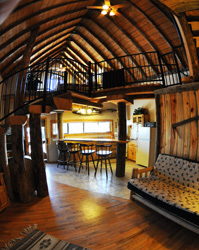 Visit the Photo Gallery for your virtual tour of the lodge. We have a large patio area where we cater meals for bus tours, special events, weddings, reunions,we can even pack up picnic lunches.